Fundamentals of Buddhism. 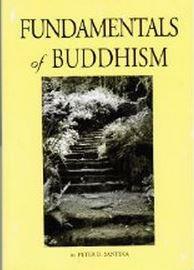 This 136 pages work by Dr. Peter D. Santina covers the basic Buddhist teaching over a series of twelve lectures. Among them are the life of the Buddha, the Four Noble Truths, the Noble Eightfold Path, Karma, rebirth, dependent origination, the three universal characteristics and finally the five aggregates. – Good introduction to the basics of Buddhism. Basic Buddhist teaching over a series of twelve lectures.